Looking for the best cheese shop in Paris? Looking for more tips on how to shop in Paris like a local? Be sure to get our 2019 INSIDR Paris Shopping Guide! Treat yourself with some cheese shopping in Paris! The French definitely excels in making the world’s best cheese, now pamper your taste buds with some dairy délicatesse with our list of favorite cheese mongers in Paris. Read on to discover how to find the best cheese shop in Paris. If you have absolutely no idea on how to start with cheese appreciation, or if you are already a cheese connoisseur, doesn’t matter, you should head to Paroles de Fromagers for an amazing cheese tasting experience! They give English-speaking professional cheese-tasting tours for different levels, from amateurs to experts, you will find a cheese that wows you! One thing special about this shop is that they associate cheeses with wine that you can taste in their cave, what a wonderful cheese & wine pairing time you should not miss out! Parole de Fromagers is a strong contender for the title of best cheese shop in Paris. On a hunt for some perfectly refined and matured French cheese? They are traditional cheese refiners since 1950 with a wide and qualitative selection! Don’t belittle this seemingly-small boutique, you will risk not having such good-quality cheese elsewhere ever again! Definitely one of the best cheese shop in Paris. This cheese shop is one of the best in town, crammed with of cheeses freshly made in the shop daily. From mild to strong, Mont d’Or, Beaufort d’Alpage, Saint-Marcelin, and the famous fluffy Fontainebleau…it’s your call! There is even a underground cheese cellar for you to explore the world of French cheese! Definitely a must if you’re searching for the best cheese shop in Paris. French cheese is important but we know sometimes you just forgot about it when there are so much to see in Paris. Come to Galeries Lafayette for some pre-flight last-minute stock-up of the cheese to bring home with. They don’t do random cheese selections like any other department stores, but gastronomic cheese that brings out the best of France. Strongly recommended for cheese lovers looking for the best cheese shop in Paris. If you are looking for exquisite French cheese from small farmer producers that make cheese with raw milk, this is the cheese monger you are looking for. They offer more than 120 high-quality varieties chosen weekly, and personalised advices to pick the cheese that goes best with your preferences. Some cheese products are from England, Spain or Italy, if you are tired of French cheese (which is rarely possible). Now come grab some excellent cheese home without breaking your bank, or simply enjoy their cheese platters at the cellar! Definitely one of the best cheese shop in Paris. If you’re lucky to hit Paris under the sun, Marché Bastille is definitely worth your time for delicate, sometimes organic, French cheese! 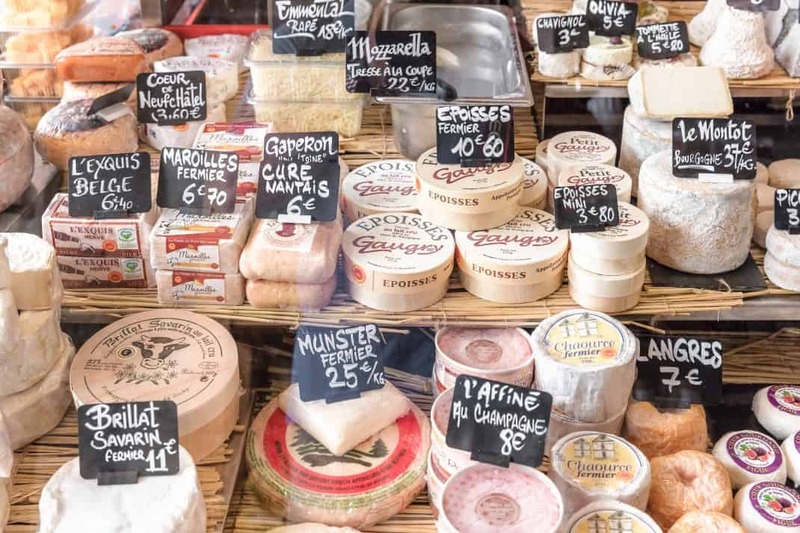 This outdoor market is packed with local producers and cheese mongers, you can get to try very regional cheese that is hard to be found elsewhere in Paris. Now is time to grab some cheese and baguette for a lovely picnic! Marché Bastille is among the best cheese shop in Paris. The ultimate cheese paradise! If you can’t wait for cheese-shopping and fancy a cheese dinner today, this is the place you must go! They do cheese fondues, raclette cheese, wines and beers from the French Alpine region Savoie. The most amazing thing is that you can DIY scrap your own raclette from a giant cheese block and let it roll on your plate. Do you see the passers-by outside salivating? “Qu’est-ce que vous me conseillez ?” – What do you recommend? “C’est fort, le Vieux Lille ?” – Is Vieux Lille a strong cheese? “C’est quel type de lait, le Cantal ?” –What type of milk is Cantal made with? “C’est possible de goûter le Roquefort ?” – Is it possible to taste the Morbier? No need to thank us, practise your French now!